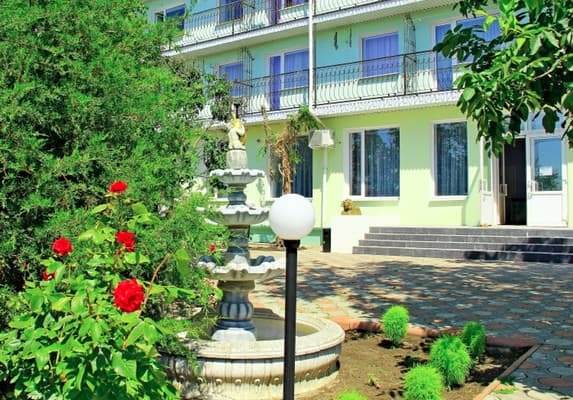 Grand Hotel Nariman is located 400 meters from the center of Genichesk and 1.5 km from the bus station. 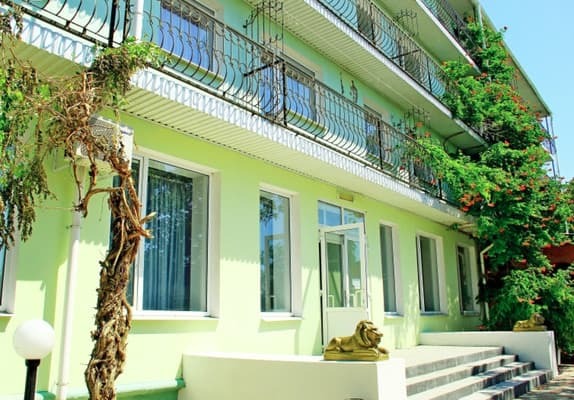 The hotel is four-storey, in a new building overlooking the port, the sea, the strait and Sivash. 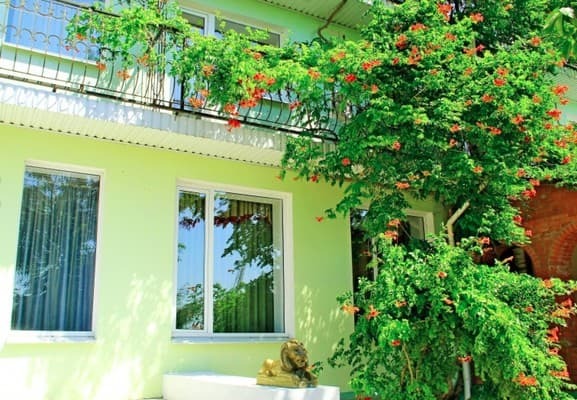 Rooms with a view of the sea or the city with a total area of ​​15 square meters. up to 30 sq.m., consist of a bedroom and a bathroom, some have an entrance hall. The rooms are equipped with single or double beds. 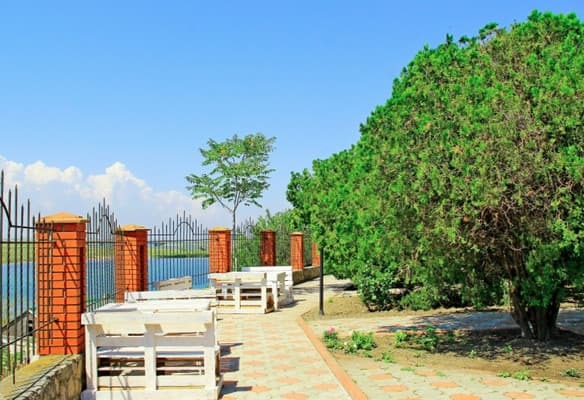 The hotel "Grand Hotel Nariman" also has its exit to the strait where you can enter the water and sunbathe on your own sandy beach. All rooms have free wi-fi and a flat-screen TV. In the "Grand Hotel Nariman" there is a private parking with access to the city center. In the building and on the territory there is a restaurant with Crimean Tatar cuisine. 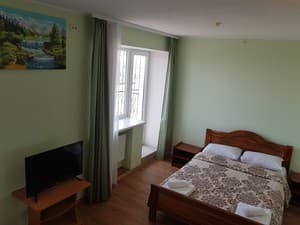 The distance to Genichesk railway station is 3 km., To the city beach 1200 m., But the hotel provides free delivery to the beach. Description of the room: In a double standard with private facilities in the room with a city view of 15 square meters. there are two beds of 0.9 m., a bedside table, a table and a chair. There is also a bath towel and a hand towel for 2 sets. Description of the room: Triple room with a sea view with a total area of ​​23 square meters. consists of a hallway-bedroom and a bathroom. 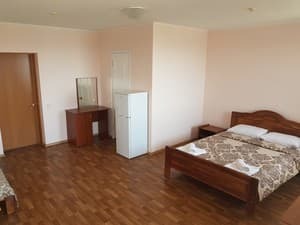 The room has a table, chairs, a suitcase closet, a single bed 900mm and one double bed 1.60 m., A mirror, a tea set, slippers, a refrigerator. Description of the room: Quadruple room with a sea view with a total area of ​​23 square meters. consists of a hallway-bedroom and a bathroom. The room has a table, chairs, a suitcase, 2 single beds and one double bed 1.60 m., A tea set, slippers, a refrigerator. Description of the room: Two-room suite with a view of the city with a total area of 30 square meters. consists of an entrance hall, a bedroom and a bathroom. 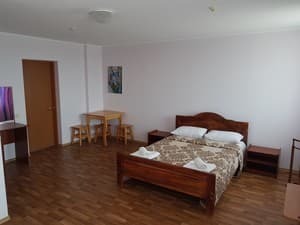 In the hall there are a table, chairs, a suitcase closet, 2 single beds, a tea set, slippers, a refrigerator, and in the bedroom there is a double bed 1.60 m. With bedside tables and a wardrobe and a mirror, some rooms have a dressing table. Description of the room: Two-room suite with sea view with a total area of ​​30 square meters. consists of an entrance hall, a bedroom and a bathroom. 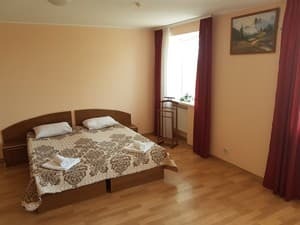 In the hall there are a table, chairs, a suitcase closet, 2 single beds, a tea set, slippers, a refrigerator, and in the bedroom there is a double bed 1.60m. with bedside tables, wardrobe and mirror, in some rooms there is a dressing table. 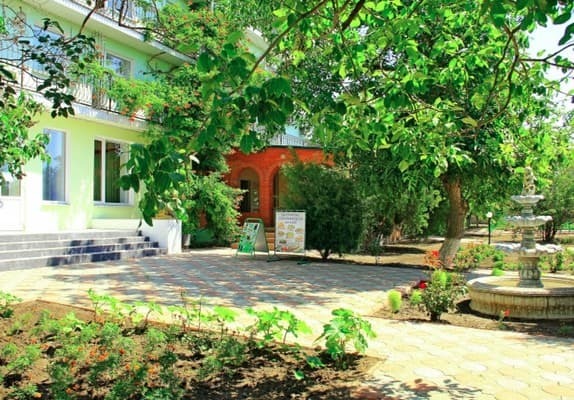 On the territory there is a restaurant with Crimean Tatar cuisine. Grand Hotel Nariman is located 400 meters from the center of Genichesk and 1.5 km from the bus station. The distance to Genichesk railway station is 3 km., To the city beach 1200 m.
From the bus station Genichesk through Prospekt Mira 1.5 km ..